Hello Aspirants, We got many messages regarding the AFCAT 1 2016 questions which were asked in the exams and the answers to them. 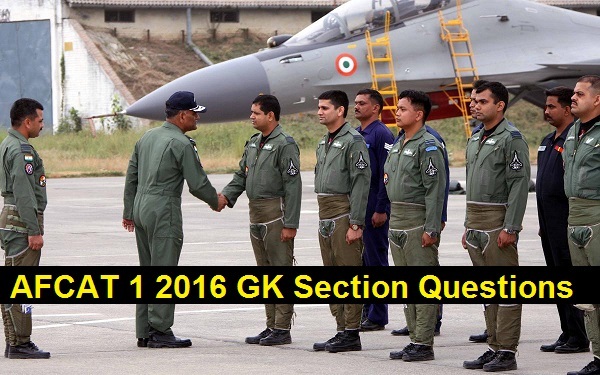 SO we decided to post a article on GK questions which were asked in the afcat exams which was recently held on 21st February 2016. You may check out the article and go through the article and check the answers for the questions which was asked in the exams. For any questions kindly comment below. Below we have listed few questions of General knowledge section which we could recall and share it with our readers kindly go through the questions below and check the answers which you answered in the written exam. Check below. 3. Rajya Sabha members retire after ? 4. Sania Nehwal lost the match in which country ? 5. Which movie got the lotus award recently ? 6. Which Indian person got France highest gallantry award ? 7. Which bowlers ball hit the Australian batman Phillip Hughes ? 8. How the current is converted from AC to DC ? 17. How many degrees are there in one minute. 20. Operation during Nepal earthquake ? 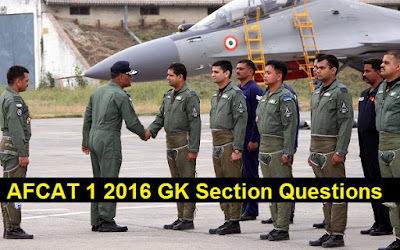 So this was all about AFCAT 1 2016 GK Section Questions Answers. Hope you would have recall your answers which you answered in the exam. Kindly share this article with friends if you found it helpful. Keep following us for more updates on AFCAT 1 2016 results. Feel free to share your views below in comments. If you could recall any more questions which we have left out kindly share below in comments.